What you need to know about the diversified industrial's guidance for next year. HONEYWELL INTERNATIONAL SELLS COMPONENTS USED ON NASA'S JUNO MISSION TO MARS. 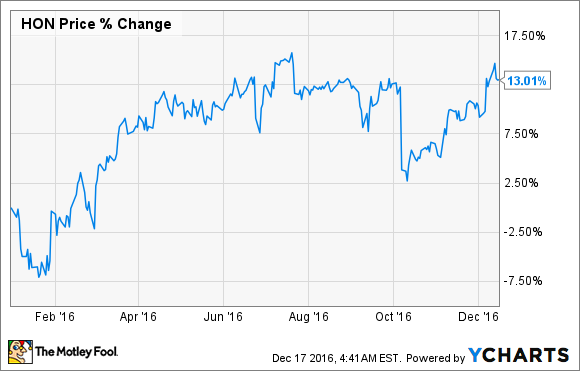 IMAGE SOURCE: HONEYWELL INTERNATIONAL INC.
Honeywell International Inc. (NYSE:HON) was the latest industrial giant to give its 2017 outlook. Whereas General Electric Company (NYSE:GE) delivered a relatively positive outlook, with CEO Jeff Immelt sounding an optimistic note on the U.S. economy, Honeywell International's outlook was a bit weaker -- somewhat like peer and onetime merger candidate United Technologies Corporation's (NYSE:UTX) outlook. Full-year 2016 EPS of $6.60 at the low end of the $6.60-to-$6.64 range given in the third-quarter earnings presentation. Full-year 2016 sales, segment margin, and free-cash flow guidance left unchanged. Organic sales growth in the range of 1% to 3%. Full-year EPS guidance range of $6.85 to $7.10, which straddles the analyst consensus for $7.08 and implies growth of 6% to 10% -- just about hitting the "targeting double-digits" growth guidance given in the third-quarter presentation. Free cash flow in the range of $4.6 billion to $4.7 billion, implying growth of 8% to 11%. It's always slightly disappointing to see weak looking EPS guidance, but the segment margin outlook is good, and the free cash flow guidance is a confirmation that the company's free cash flow conversion will increase notably in the future as the company moves out of a heavy investment phase. Moreover, the value proposition -- based on underlying free cash flow generation -- is good. On the outlook presentation, management suggested that capital expenditures would take a mild step down in 2017 to around $1 billion and then a broader step down to the $800 million range, as the company moves out of its heavy investment phase. Given the forecast for free cash flow of around $4.65 billion, ongoing growth in earnings, and the reduction in capital expenditures, it's not hard to see free cash flow hitting $5 billion to $5.2 billion in 2018. That could see Honeywell trading on an enterprise value (market cap plus net debt)-to-free cash flow multiple of 18.8, and that's not bad for a company growing earnings in double digits. If you can ignore the near-term headwinds, then Honeywell is a good value.